Give the gift of entertainment and cheer with a Laugh Factory gift card. The gift card has no expiration date and can be redeemed for any event. Great for friends, parents, co-workers, and anyone who might just need a night away...who knows, they might just let you tag along! 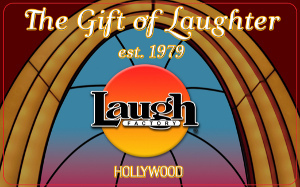 Laugh Factory gift cards are valid for ticket purchases (not valid for food or drinks). Must be redeemed at the location purchased through (not transferable to another club). INTERNATIONAL BUYERS- Please contact us at (323) 656-1336x1 to complete your order. Giftcards are mailed out Prioirty daily, any orders after 1PM will be sent out the following day. If you would like to expedite the order in 1-2 days for additional cost, please contact us at 323.656.1336x1. International shipping is not included.